It is number four in a series of MacStrategy security articles. A secure disk image can be used to securely store documents and data on any storage device. It is commonly used for storing documents such as a simple password list. Follow the instructions below to create a secure disk image on your Mac. Go to Macintosh HD > Applications > Utilities > open Disk Utility. Go to File menu > New > Blank (Disk) Image. Enter a name for 'Name' (this is the name of the secure disk image as it will appear on the desktop icon when mounted - it can be different to the "file name"). Choose the size of the image by clicking the 'Size' pop-up menu. Make sure the size of the image is large enough for your needs as you cannot increase the size of an image after creating it. You will be creating a "sparse bundle" image which only takes up as much space as there is data in it so choosing a large file size is okay. Choose a format by clicking the 'Format' pop-up menu (we recommend the "Mac OS Extended (Journaled)" option). Choose an encryption method by clicking the 'Encryption' pop-up menu (we recommend the "256-bit AES encryption" option available in Mac OS X 10.5 or later). Choose a partition by clicking the 'Partition' pop-up menu (we recommend the "Hard disk" option). Choose an image format by clicking the 'Image Format' pop-up menu (we recommend the "sparse bundle disk image" option). Enter a password and verify it. (You can access the Password Assistant from this window by clicking the 'key' icon). Deselect/untick "Remember password in my Keychain" and click the "OK" button. Your disk image will be created and mounted on the Desktop. When you have finished using the disk image unmount it by ejecting it/dragging its desktop (mounted) icon to the Trash (do not drag the actual disk image file to the Trash). 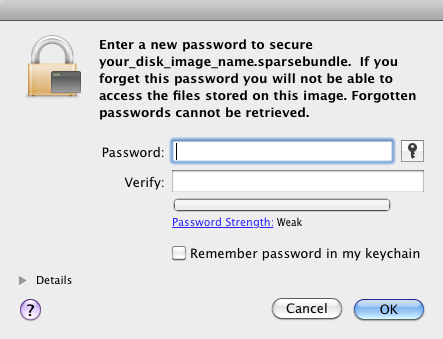 The disk image is now secure as it can only be opened by double clicking on it and entering the correct password. NOTE: When you open the disk image make sure you deselect/untick the "Remember password in my Keychain" option otherwise the password will be stored in your Keychain and it will defeat most of the purpose of creating and using a password protected secure disk image in the first place! NOTE: This process will erase your selected volume / storage device and wipe all data from it. Connect the hard disk/storage device to your computer. 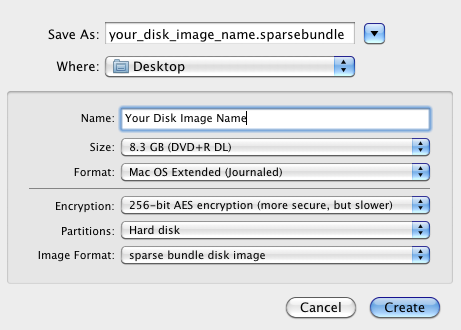 On the left in the Disk Utility window select the hard disk/storage device you wish to encrypt. Select "Mac OS Extended (Journaled, Encrypted)" from the 'Format' pop-up menu. Type a name for the hard disk/storage device. Click the "Erase" button in the bottom right. Enter a secure password when prompted. Locate the hard disk/storage device's icon on your Desktop (if it's not visible make sure "Hard disks" and "External disks" are ticked in Finder menu > Preferences > General tab). Right/control click on the hard disk/storage device's icon. Select "Encrypt" from the contextual menu. Enter a secure password and hint when prompted. Click the "Encrypt Disk" button. Apple's included FileVault technology allows you to encrypt data on your Mac's hard disk. FileVault v1 (Mac OS X 10.3 to 10.6) can encrypt entire home folders whereas FileVault v2 (OS X 10.7 or later) can encrypt entire boot disks including external hard disks. NOTE: Some applications like those in Microsoft Office (Word, Excel, PowerPoint) and Adobe Acrobat allow you to secure documents using password protection. In general we do not recommend the use of such facilities as they are easily broken/hacked. Use a secure disk image or encrypted ZIP archives instead. NOTE: Encryption solutions usually require specific operating system versions - it is possible for an official Apple macOS / OS X / Mac OS X update to break such solutions which means that you cannot update your OS until the solution is verified/updated to work with it - this could actually leave you less secure with an unpatched OS while you wait. NOTE: On 29/05/2014 the TrueCrypt web site contained a message that the development of TrueCrypt had ended and "Using TrueCrypt is not secure as it may contain unfixed security issues". A good write up about this and the future of TrueCrypt can be found here.